What’s a Faux Hawk Hairstyle For Men And Will It Suit Me? As the name suggests, the Faux Hawk (or Fohawk) is a restrained variation of the Mohawk. Instead of a bald sides and a spiked top, the Faux Hawk features short sides and a crest on top. This men’s hairstyle partly owes its fame to David Beckham who’d sport is as his trademark haircut back in 2005. Despite trend fluctuations, the Faux Hawk is a consistently modern haircut that dominates the barbershop. 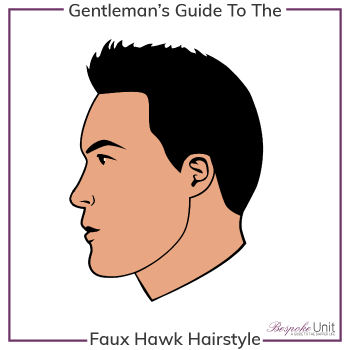 The Faux Hawk’s signature is the use of volume on top in the form of a crest. The hair flows from the back towards the front. The look is often sharpened by constructing a prickly thickness into a spiked ridge with hair product. Firstly, the key to a successful Faux Hawk is creating a dynamic style. The features are accentuated with heightened angularity that exudes energy. By bringing the hair to the front, the top resembles a duck tail with a slight quiff. An incredibly versatile style, the Faux Hawk can be combined with a number of styles to create a unique look. Most short back and sides haircuts can be used to style it without needing a trip to the barbershop. Furthermore, it can be created using length as little as an inch (2.5 cm) to as much as 4 or 5 inches (10 – 13 cm). The Faux Hawk usually appears with a Fade on the sides. This grants a seamless transition along the temples to the centre crest. Similarly, it can be matched with an Undercut for a more disconnected separation. The use of a v-shaped neckline can elongate the head’s depth. This can be kept long for styling and give the impression of a continuous still from front to back. However, if the wearer prefers angular cuts with closely shaved sides, it will require frequent touching up by a professional. Furthermore, the front can be formed into a forward Fringe instead of a peak. This allows for the front to fall across the forehead to reveal the texture along the top. In turn, the finishing result can distance itself from the electric duck tail and edge towards more mysterious Fringe territory. Firstly, the Faux Hawk is very easy to style. Thanks to its versatility, it can be restyled without an extra visit to the barbershop. However, hair does benefit from a cut that hones it to be styled this way. With the use of strong product on damp hair, the top is moulded with the fingers from the ridges towards the centre. Once the hair is arranged correctly, slip the fingers under the hair and lift it whilst guiding it towards the front. Varying quantities of product can be used depending on the desired hold. For a glossy finish, pomade is recommended. Alternatively, if a more natural look is preferred, a matte wax can be used instead. Finally, a key advantage of this hairstyle is that it can be worn for most occasions without appearing overbearing or stuffy. Therefore, it can be styled for a wedding to provide a modern flair to formal attire or sported on a casual night out. For the office, it suits most professional environments and can exude energy and confidence. Will A Faux Hawk Suit My Face Shape? With a plethora of ways to style to Faux Hawk, there are a variety of solutions for men and their different face shapes. Nevertheless, there are a few factors to keep in mind when personalising it for yourself. There are 7 unique face shapes, which play a deciding factor in how hairstyles suit people. If you don’t yet know your face shape, we strongly recommend you quickly follow our face shape identifying guide before you continue reading this section. 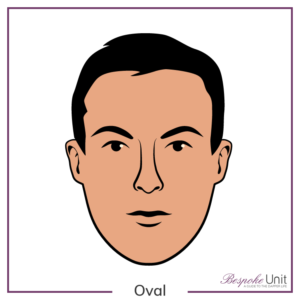 Oval fare well with Faux Hawks and are very well suited to the style. The crest’s angular sharpness ensures that your features aren’t softened so you can vary the length on the back and sides. Round face shapes benefit the most from the Faux Hawk. The textured volume on top provides an angular length whilst short, Faded sides help in elongating the face. Square shaped faces can enjoy experimenting with this style at their leisure. On the other hand, be careful that the crest isn’t too narrow given the width of their foreheads. 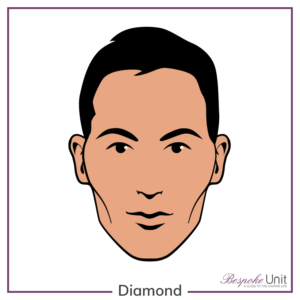 Diamond face shapes need to take care that the cut isn’t too angular. Make sure that the crest is wide enough to add build to the forehead to avoid it appearing too narrow. Likewise, maintain a low Fade to tuck the ears in. Heart shaped faces can try the Faux Hawk but the crest needs to be softly textured and the front falls down as a fringe to the side. Triangle faces may struggle due to their prominent jawline. Their strong chin reflected by the tall crest may increase their face length. Oblong faces also run a risk of severely elongating the face so it’s best to simply avoid the Faux Hawk. Therefore, maybe try something with a Fringe that features a textured top? Guys, thank you again for your great style guides. I am rebooting my style post-divorce and the Bespoke Unit has been a huge help. I have used your shoe guide to update my wardrobe, your beard guide to sport a new scruff style after 50 years of never having a beard and now I am off to update my hair style. You guys are invaluable to this newly single guy. Your comments are very much appreciated! I’m glad that we have been of help through what is often a very difficult transition. Looking forward to seeing your comments in the near future!